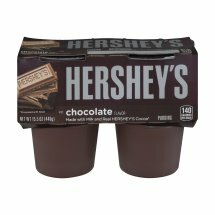 Hershey's Chocolate Flavor Pudding. *Processed with alkali.Made with milk and real Hershey's cocoa*.140 calories per snack. Skim Milk, Water, Sugar, Cream, Modified Food Starch, Cocoa Processed with Alkali, Contains Less Than 2% of Gelatin, Salt, Sodium Stearoyl Lactylate (for Smooth Texture), Natural and Artificial Flavor, Vitamin A Palmitate, Vitamin D3.